While EU officials have been locked for months in tough negotiations to keep Greece in the single currency union, billionaire investor Warren Buffett says a so-called ‘Grexit’ won’t be such a bad thing. 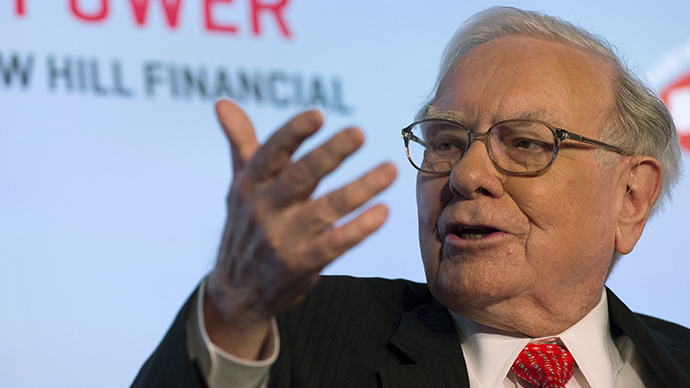 Greece leaving the eurozone could be a good idea, the chairman of international conglomerate Berkshire Hathaway Warren Buffett said in an interview with CNBC Tuesday. "If it turns out that the Greeks leave, that may not be a bad thing for the euro," the businessman told CNBC. He also claimed that eurozone members could come to a better agreement over fiscal policy if Greece left the single currency. "If everybody learns that the rules mean something and if they come to a general agreement about fiscal policy among the members or something of the sort, they mean business, that could be a good thing,” Buffett said. It was not "ordained" that the euro had to have "exactly the same members it has today,” Buffett says. Adequate management is the thing which is in need, according to him. "But it is ordained that over time the countries in the eurozone have to have somewhat compatible labor laws, fiscal deficits, general management of their economy that don't result in outliers that really aren't playing the game the way the rules are supposed to be, and we may find out very soon about Greece," the billionaire said. Meanwhile, relations between Greece and its European creditors are progressing slowly. Athens failed to reach a deal with the European Union and the IMF on Monday as its package of reforms was rejected. The ‘Brussels Group’ of representatives from the EU and the IMF claimed it was more a list of ideas than concrete reform plans. This means the last €17.2 billion tranche of bailout aid for Greece remains locked. Athens which currently faces the prospect of running out of cash by April 20, last month received an extra $1.1 billion funding from the European Central Bank. ECB thus increased the amount of money Greek banks could borrow under its emergency lending program to $77.8 billion. The EU is currently holding back crucial financial aid as the European Commission has made $2 billion of unused funds available to Greece. Greece received two bailouts from the EU in 2010 and 2014 totaling €240 billion. Having taken on austerity measures, Greece saw its economy losing a quarter of its value, with a third of Greeks living below the poverty line and unemployment exceeding 30 percent. Now Athens needs to repay €450 million to the IMF next week. Foreign investors must be repaid about €700 million, while €1.4 billion in treasury bills expire on April 14. Greece's bailout program was extended by 4 months in February, but the country has yet to present a list of reforms acceptable to its international lenders. Greek Economy Minister Giorgos Stathakis said on Tuesday he expected an agreement with Greece's creditors on reforms to be reached next week. Eurozone deputy finance ministers are expected to hold a short conference call on Greece later on Wednesday. Earlier this week media reported a possible Greek request for Russian economic help which hasn’t yet been officially confirmed. Meanwhile, Greek Prime Minister Alexis Tsipras is to visit Moscow on April 8, planning to boost cooperation and strengthen ties.